Tortuga, Sunsplash and Sunsations are modern catamarans that can accommodate up to 90 people. Experience the fun and freedom of cruising the Caribbean. If you are looking for a fun activity for a group, family reunion or pre-wedding mixer, a private catamaran cruise is a sure thing. Great for all ages, active or non active people, swimmers, non swimmers, nature buffs or party people. The catamarans have washrooms, bar, shaded and sunning areas. An energetic, experienced and friendly staff is on hand to ensure the groups safety and fun. Snorkeling gear is provided. If you are staying on the beach you will be picked up from your hotel. Your catamaran is anchored on the beach and with the assistance of the crew you wade in the water to enter the catamaran. The water is shallow but bathing suits are suggested as it might be thigh high. If you are staying at a property on the cliff, a shuttle boat will be used to get you on aboard. The reef off the Negril beach is the perfect snorkeling spot. The Caribbean Sea is usually calm, warm and crystal clear. Reef preservation now includes snorkelers wearing a flotation devise to protect the reefs and this has resulted in more fish and new reef growth . Your experienced crew will supply you with fins and masks and ensure new and experienced snorkelers have a great experience. 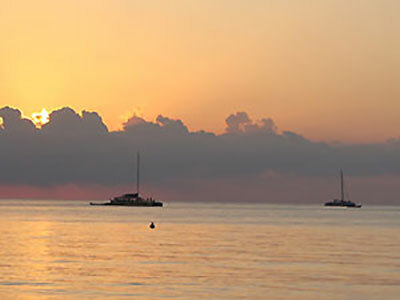 Feel the warmth of the sun and the sea breeze as you cruise along the cliffs of Negril. Rick's Cafe is usually a must do in Negril. The cruise takes you along the cliffs to Ricks where a shuttle will take you to shore. Watch the cliff divers (or try it yourself) . You can purchase drinks or food at Ricks. Your experienced and energetic crew is here to ensure everyone has a great time on board. This is the place to let go and party! Lively Jamaica music will get everyone dancing.